What Day Of The Week Is June 10? 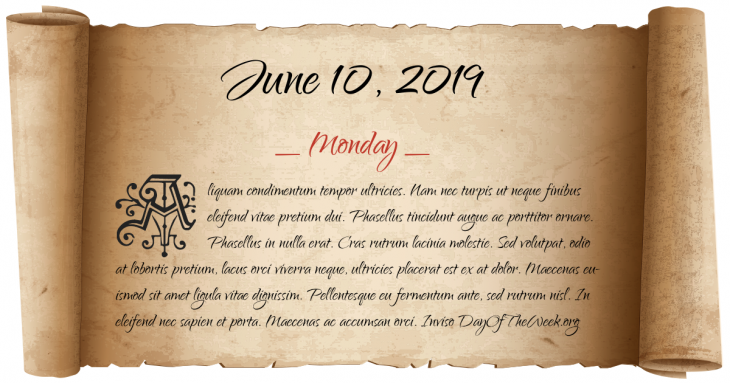 June 10, 2019 is the 161st day of the year 2019 in the Gregorian calendar. There are 204 days remaining until the end of the year. The day of the week is Monday. Mount Tarawera in New Zealand erupts, killing 153 people and destroying the famous Pink and White Terraces. Spanish-American War: U.S. Marines land on the island of Cuba. World War II: U.S. President Franklin D. Roosevelt denounces Italy’s actions with his “Stab in the Back” speech at the graduation ceremonies of the University of Virginia. In baseball, 15-year old Joe Nuxhall of the Cincinnati Reds becomes the youngest player ever in a major-league game. Vietnam War: The Battle of Dong Xoai begins. Pope John Paul II canonizes Lebanon’s first female saint, Saint Rafqa. Who were born on June 10?